Patrick Barlow’s madcap adaptation of the 1935 Hitchcock thriller, “The 39 Steps” (from the novel by John Buchan) seems like it’s getting staged a lot these days, and that’s easy to understand. It requires very few props, no scenery, only four actors, and when done well, it’s a freaking hoot. Stages Theatre takes on the task and succeeds admirably about 97% of the time. The unique aspect to this show is, it not only is slapstick, abstract and always on the move, but it actually has a recognizable mystery plot, a genuine character arc and a nifty surprise ending, very true to Hitchcock. 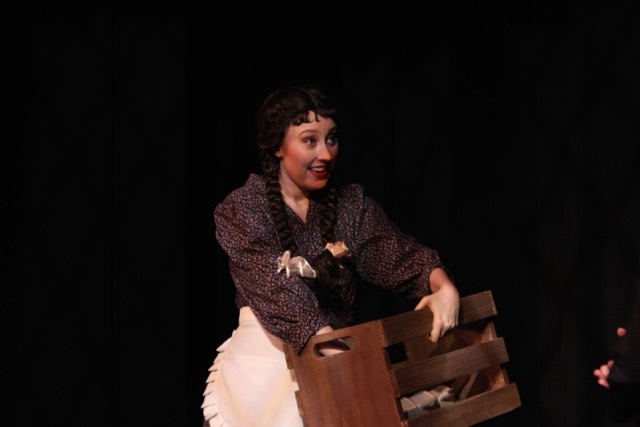 This production features four adept and funny performers, some silly and hysterical ideas from director Jill Johnson and onstage piano accompaniment by Jeffrey Larson, which helps to cover some of the slower scene changes. In this show, any pause longer than 5 seconds seems like a lifetime. The pace is that frenetic. audience follows him through this zany adventure as he gets mixed up with seductive ladies, foreign spies, assassins, dumb cops, idiotic handymen, Scottish farmers (and farmgirls) and a proper British lady. The plot is nearly impossible to follow, and it really doesn’t matter. The fun of this show is the rapid costume and dialect changes, mostly performed by Colton Dillion and Richard W. Burns, who are hysterical as both male and female characters. Scenes are indicated by a minimum of props, sometimes just a road sign: A car is four boxes, a train is several benches, a window is half of a frame held up by one of the actors that Hannay must contort himself to climb through. This is part of the fun. We know it’s ridiculous, and at times Hannay knows it too, but being English, he goes along with it all because he must to save himself. Hannay has been wrongly accused of a murder so he spends the whole story on the run, trying to get to the bottom of it to prove his innocence. He basically never stops running. He gets himself mixed up with a number of attractive women, all played with a variety of accents, some silly and some just British, by Jamie Sowers. Sowers does an all-star job, effortlessly sliding from one character to the next, sometimes appearing only as a portrait in a frame. Hesketh and Sowers display dynamite comic timing as the show goes along. The show requires a relentless pace, and there are times when the actors get a little bogged down in dialog-heavy scenes, as though what they are saying is important, where really it’s not. There are character moments here where we probably don’t need any more character building, but they don’t last long before the pace accelerates again. There is the occasional lapse in fast-scene changes, but that’s likely just a timing issue that more performance practice will fix. Overall, Johnson keeps the pace moving recklessly, as it should. The show is virtually non-stop gags and each performer finds their own little tweaks to add more humor. Highly recommended for major laughs. 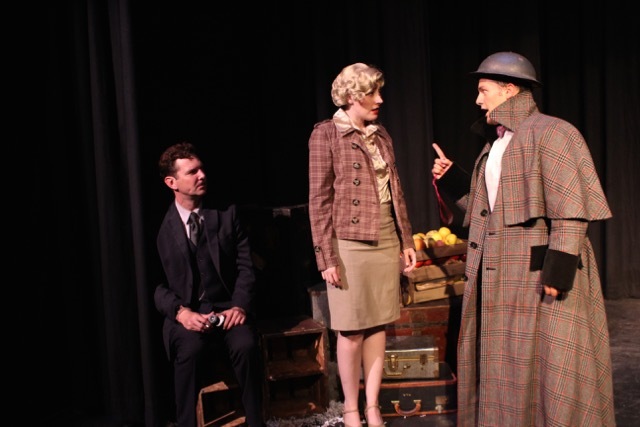 “The 39 Steps” runs at Stages Theatre through November 8, Fridays–Sundays.